Around 1,000 participants have participated Fun Run Kebhinekaan 5K in East Flood Canal (KBT), Duren Sawit, East Jakarta, Sunday (5/13). It is held to welcome the National Resurgence Day.
" 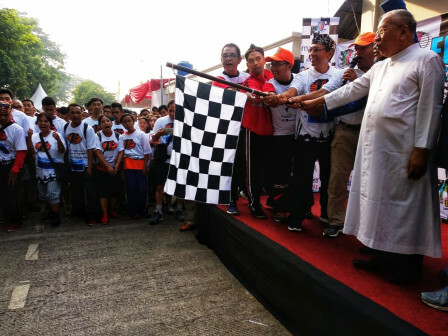 The event like this should be supported and appreciated"
After released by East Jakarta Mayor, Bambang Musyawardana, participants immediately ran down the KBT inspection road. That is starting from Malakasari sluice gate to the front of Duren Sawit RSUK and back to the starting point. It was initiated by East Jakarta Interfaith Communication Forum (FKUB) and supported by East Jakarta Administration. "The event like this should be supported and appreciated. Because in addition to healthy, it also makes relationship and maintain harmony among religious communities," he stated. Fun Run Kebhinekaan Committee Chairman, Agung Nadhi added the event is participated by 1,000 people. They are from various elements of society, tribes and religions. "The distance is about five kilometers. This event is free and the participants will get trophy prizes, charter and coaching money," he said. Hopefully it could create harmony of life among religious people in the region closely intertwined.